What is the state of research in your country and how researchers are living? Public expenditure in civil R&D has dropped by 42% since 2009. This has had a very negative effect in the grants and human resources programs, the two main pillars of R&D. Regarding grants, they have been reduced by 41% from 2011 to 2014, suffering year-long delays in the release of the call for proposals (one year was skipped), and many months delay in the transfer of the money to approved grants. In addition, there has been a sudden shift away from a bottom-up to a top-down approach (which did not exist in 2012 but which now accounts for two-thirds of the total grant budget) and a strong shift in emphasis towards favoring research projects with short-term market impacts. All this uncertainty has created chaos in the research system, stalling many research activities. Regarding the human resources programs, some has disappeared and others have suffered 30% cuts and year-long delays, affecting negatively the already dwindling employment opportunities. Hiring opportunities in permanent positions have basically disappeared. [More info on the state of human resources below]. With respect to all public spending, the R&D public funding (including credits) has dropped from 2.5% to 1.3% (in the period 2009-2013). In other words: R&D has lost priority. The austerity measures are imposed from Europe but the member states decide where to cut. 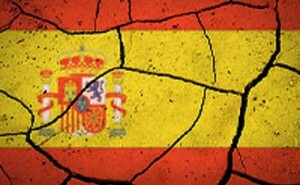 In Spain, the government has chosen, not only not to protect the public R&D sector, but to undermine it. Public investment is known to be an attractor of private investment so it is not surprising that the latter has also dropped significantly, with the number of innovation companies dropping from 48,000 to 12,000. In what condition are the research laboratories? Research centers are effectively being emptied. By law, less than 10% of the researchers that retire across the public R&D system (including universities) are being replaced. At the Spanish National Research Council in 2013 this number was about 3%. Considering that the average age of its permanent staff is approximately 57 years, and that about half of them will retire in the next 5 years, the situation is extremely worrisome. Because the number of new permanent job opportunities has been cut very dramatically this has resulted in the breech of the Ramón y Cajal contracts, the only tenure-track program in the country. As a result, the Spanish R&D system has lost credibility. Temporal positions has also been affected. Regarding Ph.D., lab technicians and postdoctoral opportunities, these are strongly dependent on contracts associated to R&D grants. However, as explained above, there has been a drastic decreased in grant funding. The year-long delay in the call for proposals and the additional delays in the transfer of money to approved grants have meant a wasted year in terms of employment opportunities. Regarding postdoctoral programs that offer some degree of scientific independence (i.e. not associated to grants) and tenure-track positions (the so-called Ramón y Cajal program), all these programs have also suffered year-long delays in the call for applications (again, meaning a wasted year in terms of employment opportunities), and a 30% cut in the number of offered positions (for the Ramón y Cajal and Juan de la Cierva programs). In additions, one of these programs has disappeared completely (the JAE research training program at the Spanish National Research Council, the major research institution in the country). Are there many researchers who have left your country? Absolutely. Spanish researchers without permanent positions are facing the following three options: (a) To accept low-quality employment with shorter contracts (could be a few months), decreased wages and loss of scientific independence. (b) To abandon R&D activities; given the lack of an innovation private sector able to employ these researchers, this implies valuable scientific skills that are lost from the country. (c) To emigrate; in many cases this is a one-way ticket because of the loss of credibility of the system after the sustained budget cuts and the breech of the tenure-track Ramón y Cajal contracts. Even though Spain is currently suffering an acute case of brain drain, including the fled of some senior, well-known scientists, the government has not bothered to carry out a study to assess the problem and keeps maintaining that the brain drain doesn’t exist. What are the future prospects for the next 5-10 years? Research needs stable funding and long-term planning, but these necessary conditions are not being met. The intellectual cycle is much longer than fiscal year so the cuts in R&D budget of the last few years will undoubtedly have a negative impact on the scientific output during the next decade. In addition, the loss of scientific talent leaves the country without the people that can actually make the R&D system competitive, and this will negatively affect the country’s return from Horizon 2020 programs. The brain drain will increase the divergence of Spain with respect to EU countries in terms of the percentage of the population engaged in R&D activities, leading to an ever increasing science and innovation gap. The government perception is that there are too many researchers that the system cannot afford. “If you don’t plant the seeds you don’t need farmers but you starve” (quote from Norman Augustine, former Lockheed Martin CEO). France has decided to give life to “Sciences en marche”, Why it’s so important to demonstrate now and what are you hoping to achieve? We need the Spanish government to take urgent measures to stop the brain drain because it is not allowing the much needed generational renewal of the aging public research centers and universities and this can have a very high social cost. The discouragement of the youth to pursue science careers is also a side effect that will have long-term consequences. There was a Parliamentary agreement last December to support R&D activities in the country. The proposed measures included the recovery of the R&D budget to the level of 0.6% of GDP in the next three years, the elimination of the current restrictions on hiring in the public research system, and the creation of the national research agency as an autonomous and politically independent institution with a multi-annual budget. This agreement was signed by all the parties with representation in Congress (from left to right, from separatists to centralists), except the ruling party. We need the government to reconsider its position and urgently implement these measures. We also need the European Union to react quickly. Investment in R&D is positively correlated with the growth of the gross domestic product. The latest data available, corresponding to 2012, indicate that in Spain the total R&D spending (public + private) is only 1.3% of the GDP, well below the 2.08% average in the EU-27 and very far from the 3% goal set by the Lisbon Strategy. The gap is increasing, not only in Spain but also in other Southern European countries. It is no accident that the European countries that have been rescued or intervened are those that invest in R&D below the EU-27 average. In these countries, the austerity measures are undermining a sector that can actually help them boost their economy. Under the current conditions, we are facing a multi-speed Europe, not only in terms of scientific production and knowledge generation but also in terms of future economic growth. “Give a man a fish and you feed him for a day. Teach a man to fish and you feed him for a lifetime.” This Chinese proverb calls for a common European science policy in terms of R&D investment. Southern European countries should not become paradises of cheap labour and sun.